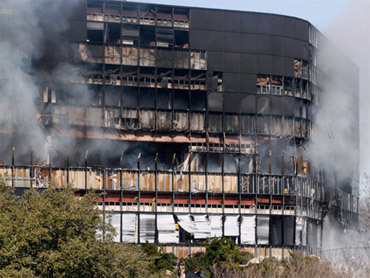 AUSTIN (CBS/AP) According to the FBI, Joseph Andrew Stack may have burned his own house down then crashed a small airplane into an Austin office complex that contained government offices. The FBI, who has an office in the complex, but not the Echelon Building that was struck, believes the IRS may have been the target. The crash sent workers fleeing as ceilings crumbled, windows shattered and flames shot out of the building. Thick black and gray smoke was billowing out of the second and third stories of the building as fire crews using ladder trucks and hoses battled the blaze. Dozens of windows were blown out of the hulking black building. Federal Aviation Administration spokesman Lynn Lunsford said the pilot didn't file a flight plan. He didn't identify the pilot. As a precaution, the Colorado-based North American Aerospace Defense Command launched two F-16 aircraft from Houston's Ellington Field, and is conducting an air patrol over the crash area. Peggy Walker, an IRS revenue officer who works in the building said she was sitting at her desk when the plane crashed. "It felt like a bomb blew off. The ceiling caved in and windows blew in. We got up and ran," she said. The IRS Web site said an office of its EP Team Audit Program is located in the building where the plane crashed. The group, known as EPTA, examines employee benefit plans with 2,500 or more participants, according to the Web site.